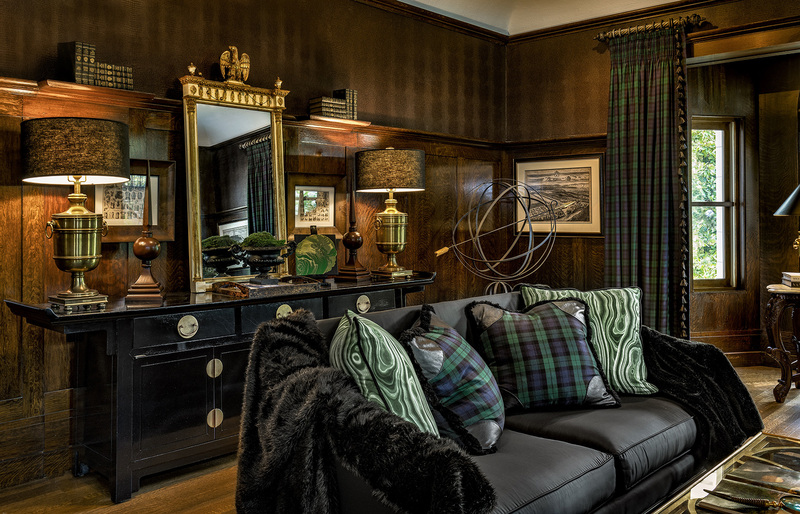 Kacey Graham and Michaele Boehm of Boehm Graham Interior Design (BGID) created a Scotch men’s lair for the New Hampshire Designer Showhouse at the Frank E. Anderson House. The interior design was a meaningful journey, not to mention loads of fun, for the talented mother-daughter team, as it gave the designers a rare opportunity to conceive something personal, rather than client-driven. As with most showhouses, there were rules. The architectural elements of the room were off-limits; BGID needed to work within the framework that was in place. 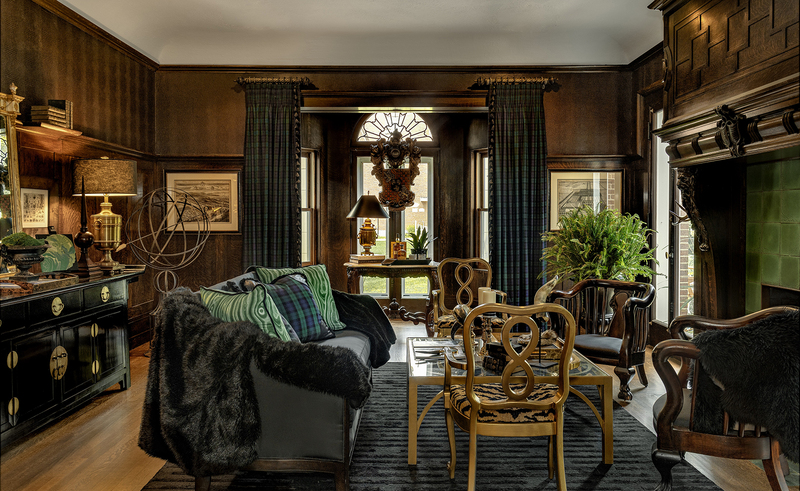 No matter, this space (a former billiards room), with its gorgeous wood paneling, fireplace and windowed alcove, was their first choice to transform. “The architecture was second to none,” shares principal Kacey Graham, and a magnificent backdrop for their design concept. What made the room so successful was its inspired cocktail of furnishings, accents and styles. 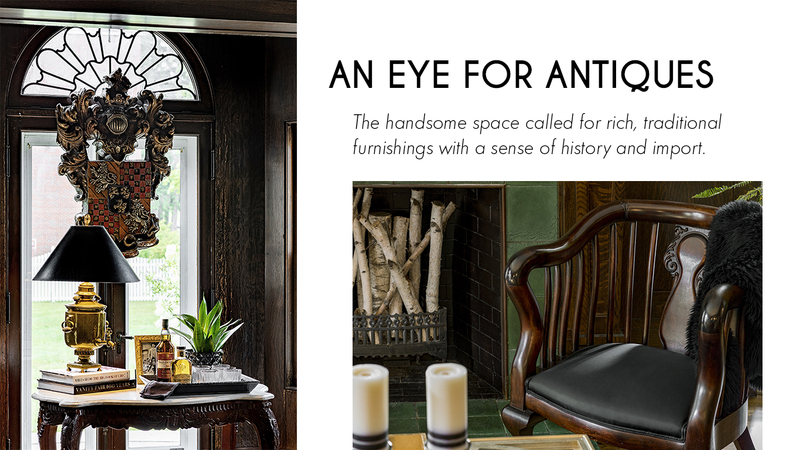 The goal was to create a masculine space, with a hint of glamour. The look is luxe and seamless, but we’ve identified four clear styles at play. We take a closer look at what’s in the mix…. 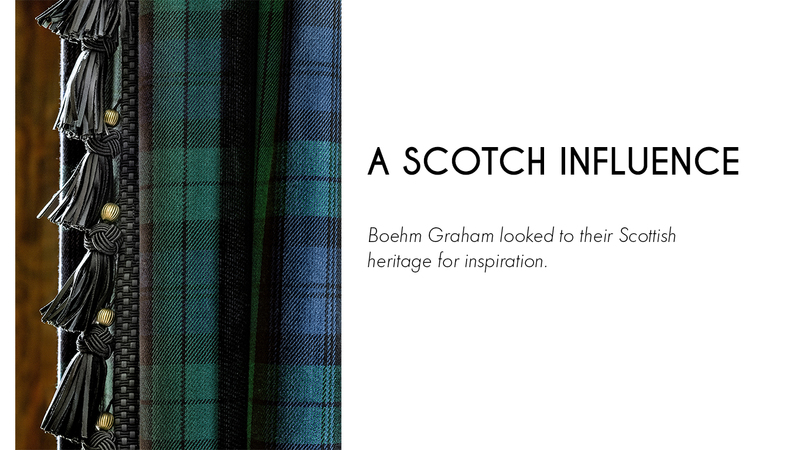 THE ELEMENTS: 1) A Graham Tartan plaid (a Black Watch variation) was used for the draperies as well as on the pillows, which are capped in black leather. 2) Black tassels and double-wide pleating at the top of the draperies evoke a Scottish kilt (Graham’s husband wore one at her wedding). Pillow fabric, drapery fabric and trim by The Martin Group. 3) A crest draws attention to the alcove and adds a sense of heraldry (BGID loves crests, and uses their family’s as their studio logo.) 4) Artwork of Scottish battlefields adorns the walls. THE ELEMENTS: 1) Faux leopard upholstery galvanizes gold accent chairs. Parker-French Antiques chairs, Belcastro Furniture Restoration; fabric from The Martin Group. 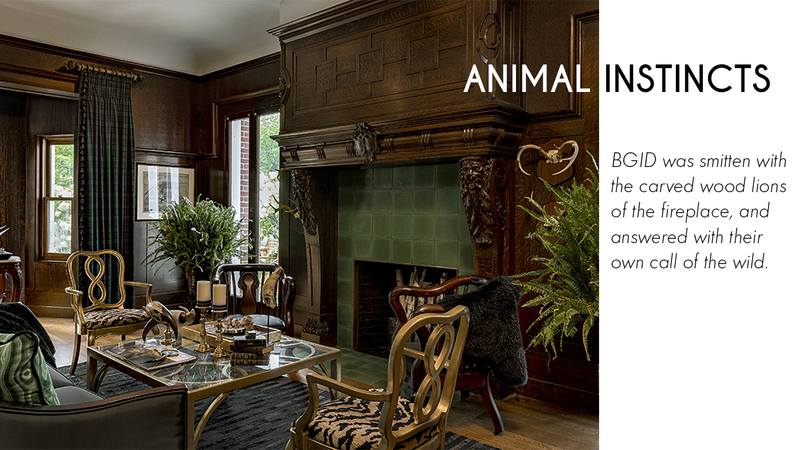 2) A brown-black crocodile wall covering adds texture above the paneling, and doesn’t overpower. It also makes the space “cozy and cohesive,” says Graham. Thibaut. 3) Accents in horn, mounted and on the cocktail table, offer both a sculptural and natural flair to the space. “I’ve always loved showcasing beautiful things found in nature,” says Graham. THE ELEMENTS: 1) A marble-top table holds court under the mounted crest. New Hampshire Antique Co-op, Milford, New Hampshire. 2) A pair of antique carved fireplace chairs were sold to the Bedford Village Inn and borrowed back for display in the showhouse. 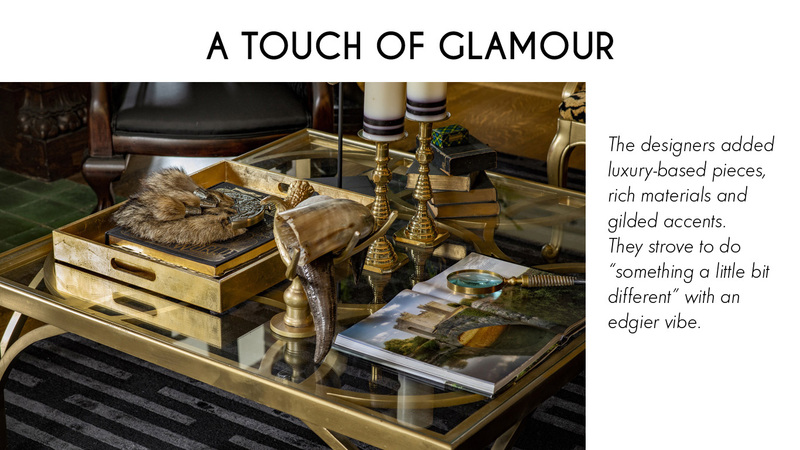 3) An ebony-colored console table with gold accents makes a statement as a sideboard. Parker-French Antiques. THE ELEMENTS: A see-through coffee table lightened up the space, and offered a peek at the beautiful Onyx banded rug underfoot. (BGID could have opted for an Oriental rug but wanted the plaid to be "the loudest voice in the room.") Cocktail table from Darby Road Home; Rug from Persian Rug Gallery, Nashua, New Hampshire. 2) A pair of brass urn lamps—at the perfect scale—illuminate the console. Black shades keep the effect a bit smoky. Ralph Lauren Home. 3) The black sofa is made in a cotton blend that has a taffeta-like sheen. "It has a richness to it," says Graham. Darby Road Home.